A couple years ago, Dawn Wilson-Clark was on a committee of residents who visited Detroit Community Schools in a westside neighborhood known as Brightmoor. Their task was to review it for Excellent Schools Detroit, a nonprofit that grades the city’s schools. What they entered was a charter school that opened in 1997 and has struggled pretty much since. Only two of its students have ever been deemed college-ready by ACT college entrance exam standards. Teachers tended to be inexperienced. Turnover was high and enrollment was dropping in a neighborhood suffering from extreme poverty, blight and depopulation. And then there were the administrators. Though teachers were paid modestly, some administrators received six-figure salaries and were uncertified by the state. More troubling, at least two had been central figures in scandals elsewhere involving misappropriation of public funds. Wilson-Clark knew little about the backgrounds of the administrators when she visited Detroit Community Schools. She was, however, encouraged by indications of progress that the school’s superintendent pointed out, including an improved graduation rate at the high school. The charter was also recently designated as a state “reward” schools, in recognition of academic gains. But Wilson-Clark, who lives in Brightmoor, said the school is not yet good enough for her family. Her four school-age children are spread out among a private suburban school, an elementary in the Detroit Public Schools system and a charter school ‒ all outside of Brightmoor. She drives 130 miles a week shuttling them between schools. That’s because Brightmoor is an educational desert. With only five schools for children in kindergarten through eighth grade and a single high school to serve roughly 7,000 children, Brightmoor lacks the quality school options that residents say they need for their children. High school is a particular void because the closest high school with decent academic outcomes is two miles outside the northeastern edge of the neighborhood; that would be Communication and Media Arts High, which has a graduation rate over 95 percent and nearly 60 percent of graduates going to college, according to state data. For the impoverished residents of Brightmoor, the only neighborhood high school is Detroit Community Schools. Places like Brightmoor are now at the center of a debate in Lansing over whether a mayor-appointed commission should be approved to have authority over all public schools in Detroit, including charters. Supporters say a single, centralized authority is needed to oversee the traditional public schools and charters that open and close with regularity across the city, creating a glut of schools competing for students in some neighborhoods, and a dearth of quality options in struggling areas like Brightmoor. Under a bill awaiting consideration in the House, a Detroit Education Commission (DEC) would be created, and one of its key roles would be to approve locations for new schools in Detroit for at least five years, so families like Wilson-Clark’s won’t have to leave their neighborhood in search of a decent education. But school choice and charter school advocates are against this approach, contending that a new commission would unfairly favor traditional public schools and limit choice. Gov. Rick Snyder proposed the idea of a commission more than a year ago with support from the Coalition for the Future of Detroit Schoolchildren, a group of community, education and business leaders co-chaired by Tonya Allen, CEO and president of the Skillman Foundation, which funds efforts to improve education in the city. The commission debate is one of the major reasons the Detroit school reform legislation – which could also include $715 million in debt-relief for DPS – still has not passed the legislature a year after the governor proposed structural changes for Detroit’s school system. Legislators and special interests are also debating whether to allow a locally elected school board to regain authority over Detroit Public Schools after years of state emergency control. Last month, Mayor Mike Duggan argued in Lansing that a mayor-appointed, seven-member commission would focus on locating schools in a manner that would help stabilize neighborhoods. The Detroit Regional Chamber of Commerce, which calls itself “pro-charter,” also supports giving a single authority power over public schools in the city. Among the toughest opponents of the proposed Detroit Education Commission is the Great Lakes Education Project, an influential statewide school choice advocacy group. GLEP contends that a mayor-appointed commission would wield its power to limit charter schools. In some areas of the city there are arguably too many schools. In southwest Detroit, for instance, where the birthrate is steady and population more dense, there are plenty of schools to choose from. Similarly, in the the 7.2-square-mile area of greater downtown, with about 4,400 residents under age 18, according to a report by the Hudson-Webber Foundation, there are at least half a dozen adjacent high schools. By comparison, the seven-square-mile Brightmoor neighborhood has only one high school for 7,000 school-age children, according to the Brightmoor Alliance, a coalition of nearly 50 local organizations. “What is it about downtown?” wondered the Rev. Larry Simmons, executive director of the alliance. “Do they have so many students? Brightmoor, meanwhile, on the city’s western edge, has seen at least six of its public schools close over the past decade, including Redford High. That leaves Detroit Community Schools, the long-undistinguished charter, as the only public high school in the area. The school serves children in kindergarten through 12th grade, 99 percent of whom are African American and 93.4 percent are low income, state data show. It reported a graduation rate of 88 percent in 2015, higher than the citywide average and up from 79 percent the prior year. But low test scores indicate that the students they are graduating are not ready to pursue a career or a college education. None of the high school students tested in 2014-2015 were proficient on all four subjects on the ACT, a benchmark for career or college-readiness. Further, of the 1,053 students who took the ACT tests since the high school first offered it in 2006-2007, only two have met the college-ready standard in all tested subjects. The school is run by former Detroit City Council member Sharon McPhail, a lawyer by training. McPhail was hired as the school’s superintendent in 2012. She is perhaps best known as a serial candidate for city office and as an adversary-turned-defender of former mayor Kwame Kilpatrick. In 2003, as a city council member, she accused Kilpatrick or his backers of tampering with wires in her desk chair to give her an electrical shock. Five years later, as the city’s general counsel, she defended Kilpatrick against Gov. Jennifer Granholm’s efforts to remove him from office. McPhail has plenty of legal experience, but is neither a certified teacher nor certified school administrator, Michigan Department of Education records show. There is, however, someone at the school with vast experience running an urban school: William F. Coleman III, the charter’s chief financial officer. Coleman is the former CEO and superintendent for Detroit Public Schools. Former because Coleman was fired from DPS in 2007 after he admitted to recommending a friend to do work for a DPS contractor while the friend was under investigation in a school bribery scandal in Texas. That friend, Ruben Bohuchot, and a Dallas school vendor were later found guilty in Texas federal court of bribery and money laundering. Coleman was also indicted in the Texas case but was allowed to plead guilty in 2008 to a reduced charge of attempting to influence a grand jury in return for testifying for the federal government, court records show. As a result, prosecutors also agreed to drop conspiracy, bribery, money laundering and obstruction of justice charges against Coleman in the kickback scheme, which the government valued at roughly $40 million. According to the indictment, the men conspired to create shell companies to accept bribes on school technology contracts for low-income schools in Dallas, where Coleman had served as deputy superintendent and chief operating officer at the Dallas Independent School District. After testifying, Coleman received probation, was ordered to pay a fine and perform community service. Coleman did not respond to requests for comment on his current role as chief financial officer at the Detroit school. McPhail, likewise, declined to be interviewed by Bridge. She did, however, respond to questions by email. She wrote that she is proud of the school’s progress and hailed Coleman's experience, saying he has never done anything questionable at her school. Coleman is not the only school administrator with a controversial past. Sylvia James was removed as a district court judge in Inkster in 2012. The Judicial Tenure Commission recommended her removal after its investigation revealed that James spent court funds on items and causes personal to her. She is dean at Detroit Community Schools. The Michigan Supreme Court upheld that recommendation and removed James, finding that James "made numerous misrepresentations of fact" to the Judicial Tenure Commission, employed her niece against court rules and misappropriated funds intended for the court's Community Service Program, including money that was supposed to go to crime victims and the elderly in Inkster. James treated court funds as her own “publicly funded private foundation,” the high court wrote, using money on items such as travel to conferences, shirts embroidered with her name, advertising and donations to charities she chose, including a school “Europe fund.” The court also found James “made numerous misrepresentations of fact under oath” during the investigation. James has since filed a lawsuit alleging the Judicial Tenure Commission discriminated against her by not filing “formal disciplinary complaints against Caucasian and male judges who were accused of conduct similar” to hers, as an African-American female. James also did not respond to requests for comment. As it happens, Sharon McPhail was James’s attorney in 2012 when James faced the allegations from the Judicial Tenure Commission. McPhail wrote Bridge that the school is “fortunate” to have James as the dean. “As a lawyer, who is licensed, she offers the students a level of insight that others have not been able to deliver. She spends much of her personal time and money on our kids,” McPhail wrote. Another administrator at the school also has a bit of controversy in her past. Patricia Peoples, the school’s director of human resources, is a cousin of former Detroit Mayor Kwame Kilpatrick. She once served as Detroit’s deputy director of human resources during Kilpatrick’s disgraced administration. She was among more than two dozen city officials who were friends or relatives of the now-imprisoned former mayor when he was under investigation. She avoided being held in contempt of court in 2008 by appearing before a Wayne Circuit Court judge who demanded she comply with investigative subpoenas seeking city documents and information involving shredded materials in the Kilpatrick scandal. Peoples did not respond to requests for comment. The staff at the school also includes McPhail’s brother, Roger McPhail, the school’s grant writer. McPhail said she disclosed their relationship to the charter school’s board and had nothing to do with the school’s staffing company hiring him. Detroit Community Schools board members did not return calls or emails from Bridge seeking comment. They include: Richard Robinson, lecturer at University of Michigan-Dearborn; Patrick Devlin, secretary-treasurer of the Michigan Building Trades Council; Nicholas Tobier, associate professor at University of Michigan in Ann Arbor; Robert Dulin, a retired pastor, and Toney Stewart, executive director of the Michigan Council of Carpenters, according to the school’s website. According to the Michigan Department of Education, some administrators at the school appear to be in violation of state law because they have not received state certification for their positions. Michigan law requires school administrators who oversee instruction or business operations to be certified by the state within three years of taking the position. Neither McPhail, who started in 2012, nor school principal Echelle Jordan, who has been there since at least 2013 according to payroll records, are certified administrators, according to state records. Nor is William Coleman, the chief financial officer. By law, if an administrator is not certified within that three-year window, the school “shall not continue to employ the individual as a school administrator,” Bill Disessa, a spokesman for the Michigan Department Of Education, told Bridge in an email. McPhail offered a curious defense for her lack of superintendent certification. She told Bridge she does not in fact hold that position. Nevertheless, when asked about her lack of certification, McPhail responded that she is not the superintendent. Instead, she said, she is the school’s chief administrative officer, and therefore doesn’t need certification. The school’s website shows that on March 23, after Bridge inquired about the certification issue, McPhail’s “chief administrative officer” title was posted on the site. It remains unclear whether, even under her newly posted title, McPhail can avoid the state’s certification requirement. State law requires a superintendent, principal, assistant principal, administrator of instructional programs or chief business official to be certified. Disessa, of DME, added that anyone with overall management and oversight of a school district or charter school is considered a superintendent and must comply with the state’s certification law. Schools that violate certification requirements can face stiff penalties. By state law, the state can cut school aid payments to the school to recoup the amount of money paid to administrators during the time they worked at the school without a license. And any school official who knowingly employs an unlicensed administrator is guilty of a misdemeanor punishable by a fine of $1,500 for each instance. Six-figure salaries are not unusual at McPhail’s school, if you’re an administrator. McPhail’s salary is $130,000, with total compensation at $160,745 when benefits are added, to oversee a school of fewer than 800 students. That’s more than superintendents receive in traditional school districts such as Eaton Rapids (south of Lansing) and Ludington, in west Michigan north of Muskegon, school districts with three times more students than McPhail’s school. Coleman and Jordan also made six-figure salaries, according to 2013 payroll records obtained by Bridge. In September 2013, Coleman was paid $4,375 for a two-week pay period, or a rate of $113,750 per year. Jordan, the principal, made $4,166.83, an annual rate of $108,337. By comparison, the school's teachers, who average less than five years experience, average $42,000 in earnings per year, according to the school. The average pay for teachers in Michigan is about $62,000, state data show. Asked why top administrators receive six-figure incomes at the school while teachers are paid so little, McPhail wrote, “Why in the world would you expect an administrator to be paid less than a teacher?” She added that she and other administrators have accepted multiple pay cuts to help the school keep a balanced budget. An up-to-date, complete list of the school’s staff names, titles and incomes is not available because, like most charters in the state, the school hired a private staffing company, in this case Midwest Management Group Inc., which is not subject to the state’s public records law. The company employs all staff ‒ except McPhail who has a contract with the school, said Ralph Cunningham, owner of Midwest Management Group. He said the school employs 95 workers, but declined to give further details. Parents interviewed as they picked up their students after school recently said they had few complaints about Detroit Community Schools. However, they noted concerns about high teacher turnover and the poor condition of the half-dozen trailers that house classrooms for elementary and middle school children. Pamela Duley has had children at the school for eight years. Her daughter is in seventh grade and aside from her daughter having to wear a coat when the classroom in the trailer gets too chilly, she has few worries about the school. Duley’s older daughter graduated and is now a student at Henry Ford Community College. Emmett Harris, whose two children started attending the DCS high school this school year, said security is good, students rarely fight each other and teachers allow students to retake tests to correct mistakes. “They won’t let you fail,” he said. DCS opened in 1997 with an elementary school, but grew as other schools in the area closed. In 2004-05, the school had 387 students. In 2007-08, after the closure of Redford High and several area elementary schools, DCS enrollment jumped to 956. In 2014, after 17 years, Saginaw Valley State University refused to continue as the authorizer for Detroit Community Schools, citing poor educational performance and administrative “dysfunction.” But the school was saved by another authorizer. Bay Mills Community College, located in the Upper Peninsula, granted the school a charter in 2014 which allowed it to remain open. Parish, of Bay Mills, said the authorizer jumped in because the school is “important to the area” and Bay Mills believed the school could improve with a more cooperative relationship with its authorizer. Education Trust-Midwest, a nonprofit education advocacy group, this year gave Bay Mills a “B” grade on its Authorizer Report Card based on performance and improvements seen at the 47 charter school Bay Mills authorizes. At the same time, Ed Trust labeled the Brightmoor school’s elementary grade level achievement as “among the worst charters in Michigan.” (see page 21). Last year, only 6 percent of the school’s students in grades 3 to 8 were deemed proficient in math and English on the state standardized test. The elementary/middle school ranked in the bottom 6 percent in the state for 2013-14. Still, there has been some improvement. The high school moved up from being ranked as one of the bottom 5 percent of schools in the state in 2013-14. It is now ranked in the bottom 25 percent. As a result, the high school was labeled by the Michigan Department of Education as a “reward” school last year for the pace of its improvement, a point of pride to McPhail. However, among 84 eleventh graders who took the ACT college entrance exam last year, state records show none scored at proficiency rates on all four subjects of the ACT, a benchmark that determines if a student is ready for college and career training. 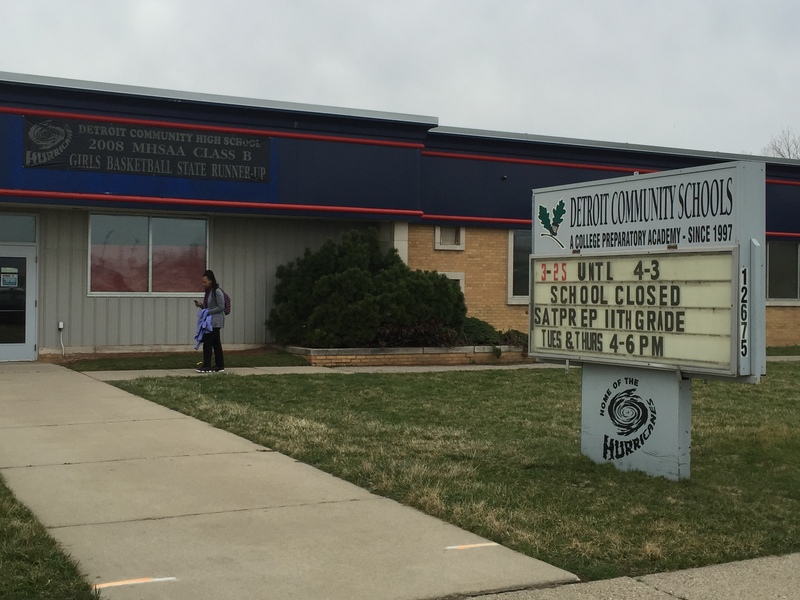 While the Detroit Community Schools has the only high school in Brightmoor, the neighborhood has four other schools that serve elementary and middle school children. They include Old Redford Academy and Detroit Leadership Academy (which has ninth and tenth-grades), both charter schools; Murphy Performance Academy, a charter school school run by the state reform school district, and Gompers Elementary-Middle, a part of the Detroit Public Schools. The fact that Brightmoor’s schools are operated by different entities is not insignificant, said Simmons, executive director for the Brightmoor Alliance. Because charters and traditional public schools compete for students and the funding they bring, these schools have few incentives to pool resources to better serve children in the neighborhood. Simmons echoes Excellent Schools Detroit, the mayor, the Coalition for the Future of Detroit Schoolchildren and the Chamber of Commerce in support of a Detroit Education Commission to be appointed to act as a neutral board responsible for determining where schools should open and close throughout the city. A Detroit Education Commission, if it works as proposed, would ensure schools are opened or closed in the most effective way for students – not the cheapest way, he said. Simmons said Detroit Community Schools should be commended for its commitment to Brightmoor, but said the community needs more and better schools. “The inner-city high school students are some of the most difficult students to teach. They arrive with histories and difficulties. There’s not a lot of desire or competition to serve that community,” he said. How shameful that we live in a state where the poorest children are nothing more than pawns in the elected officials game of greed and corruption set up to enrich lobbyists, friends, and in some cases, themselves. Thank you Bridge Magazine for your continuing coverage of Michigan's disastrous charter school situation which is truly the "Flint" of education in our state. It appears, despite law and regulation, that the Michigan Department of Education has once again failed to do the job taxpayers pay them to do. If this reporting is in fact correct, doubtful due to previous media and education trust failures in reporting on charter schools, the problems identified fall under the oversight responsibilities of the Michigan Department of Education. Where have they been since 1997? Existence of these kinds of problems in public schools may also be the result of the extensive data collection requirements imposed by the states on all schools, an expensive data collection effort that, in this case, did not reveal that problems might exist since data points contain no context and, despite the large volume of data points and reporting, are completely meaningless for measuring learning growth and opportunities for improvement. A more thorough investigation of the system of education in this state would reveal that, despite all the expenditures for accountability and measurement, public education is smothered by the rules and regulations. teachers are not allowed to teach and a large percentage of students are not allowed to learn. It has nothing to do with the MDE not doing their job. They are restricted by the very relaxed charter school laws in this state and the political power of MAPSA and ALEC. PA 451 of 1976 which governs schools in this date applies equally to traditional and charter schools. The MDE is charged with enforcing this statue. As an organization that many of the non-graduates turn to for help in completing their education, we are all too aware of the lack of resources for a good school in the Brighmoor area. Residents in this area WANT to learn, they WANT to succeed, but when they are provided with ineffective education, it tells them that they aren't worth it. Is "choice" of a school the answer? Not necessarily. Having more ineffective schools, run by uncertified management doesn't solve the problem. Unfortunately, the debate between public or choice has become more about the chasing of the money - not about fixing the broken public system or requiring the charters to prove their value by performance. But there is too much money to be made now. The genie is out of the bottle. As the DPS works to change and the new Commissions take shape, there needs to be an awareness and agreement to change the REAL problem. Simply that charter schools were intended (in theory) to present parents with a choice that was better than the available public school in their area. But when the charters were implemented 30 years ago, there was little accountability required and not much has changed. So while some turned out sound programs, others are were worse than the public schools. If a charter is really meant to offer a "choice"other than the public schools, then they should be required to perform ABOVE the public school standards. Then you can chase the money all you want, because one way or another, at least the kids will receive a viable education. Ms. Chastity-Dawes says, "Brightmoor, meanwhile, on the city’s western edge, has seen at least six of its public schools close over the past decade, including Redford High." But she provides no information on why these schools were closed. Nor does she provide any illumination on why there are "school deserts" and other areas with excess seats. Thank you Bridge for this article. Eye-opening, sad and shameful. My family has been involved in education as both public school teachers and administrators for at least three generations. My father use to compare teaching to joining the Peace Corp. And then the money began to flow in through charter schools and the grifters soon followed. Great story. Strong reporting, clear writing and an important examination of the imbedded cronyism and lack of qualifications that hurt Detroit families. I feel that DCS is an ellecent school. This school has helped my child improve in her grades coming from Mumford High. My child has learned the ability to communicate. I also feel that if the school has room to expand then more kids can attend. The grades may have improved, but I guarantee you your child isn't learning anything. McPhail is a narcissist and everything is about her. She wants to be able to boast a graduation rate that seems impressive but it's not. Teachers are forced to give grades to the students that they did not earn. This has created an environment where the kids refuse to work. They know that McPhail will make the teachers change their grades or remove the assignments from the gradebook all together. It's sad in there. I could go on and on. Thanks for bringing such a dark story to the light so that all can see! The same bunch of crooks seem to resurface over and over again in Detroit. The one constant is their ability to enrich themselves by corrupting the system. There appears to be a belief that bribery, embezzlement, etc. is a right and that everybody else did it, so I deserve it too. Wonderful read. Informative.. Wow. Thanks. Well written. Perhaps the superintendent should go by an alias of "McFail?" Perhaps the oversight of the Michigan Department of Education was not sufficient but, isn't this a little bit like blaming the Texas Rangers because Bonnie and Clyde robbed banks? Do Detroit school officials have no integrity at all? 13 of them are being hauled into federal court on bribery and corruption charges even as I write this. How can we expect the school children to be good citizens? It is in the best interest of the children who reside within the city limits of Detroit, Michigan to have the creation of a Detroit Education Commission to oversee the functionings of both the public and charter schools located therein become a reality. Clearly, left to their own devices, it appears that none of the existing educational entities can be trusted to operate in a manner that puts the interests of children first. Like it or not, the Republican control of Michigan's government, and their "damn the people - full profit ahead mentality, has resulted in the foundational concept of "education" being changed from a long-term capital investment (which USED TO BE what governed schools' operational methodologies) in the futures of the state's children into a short-term "for profit" commodity. The fact that this phenomenon has gutted public school systems in the state's urban (read Black) areas, is not an accident. Urban children are not "commodities" to be bought and sold like melons. They are human beings who deserve better. There are however some really great staff at DCHS, ... look at the work of Mr. Bart Eddy and work he does with his students, you could do a story on his work with high school students alone... He is a magnificent staff member, there are others as well ... L.